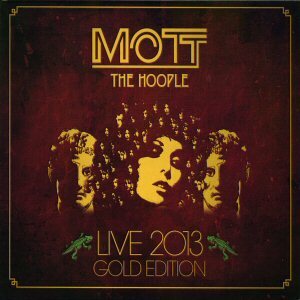 Mott The Hoople CD/DVD: "Live 2013"
At long last, an official full-length concert DVD of one of the UK's greatest-ever live acts. When Mott announced a second reunion in 2013 (following on from the first in 2009) fans were hoping that this time at least one of the gigs would be filmed to finally set the record straight regarding Mott's live prowess. Yes, we had the Hammersmith Apollo 2009 CD, but that was an "instant live" recording, available immediately and so with no opportunity to mix it properly afterwards. Hence when it was announced that the Manchester show in 2013 would be filmed fans were hoping that this time everything would be done properly. And I'm pleased to say that this is everything the fans have been hoping for. The initial plan was for the DVD to be from Manchester with the CDs from the following night at the massive O2 Arena in London, but in the end the audio proved to be much superior from Manchester. The sound is good, and the camera work captures the night perfectly. From the opening salvo of Rock 'n' Roll Queen to the closing "goodbyes" of Saturday Gigs Mott don't let up for a moment, showing what a powerful live band they still are a full 40 years on from the 70's live heyday. Bassist Overend Watts shows that he's still (in the words of Ballad of Mott The Hoople) a rock 'n' roll star as he takes on vocal duties for Born Late 58 and generally having the time of his life, interacting with the front rows and encouraging everyone to get up, much to the annoyance of the over-bearing Manchester security. Guitarist Mick Ralphs is high in the mix and his playing is good and strong, despite the discomfort he was in (he had hip replacement surgery shortly afterwards). Long-time fan and self-confessed "Mott groupie" Joe Elliott (from Def Leppard) joins the band for All The Young Dudes before Saturday Gigs brings the show to a close. So this is it - the last gigs Mott will ever do, and finally a live DVD that does them justice. It ain't the 70s (no trademark riots), but it's the next best thing.